Fashion weeks is a multi-million dollar business. Thousands of jobs got created because of this 20th century entertainment phenomena. These days every large city wants to host their own Fashion week. 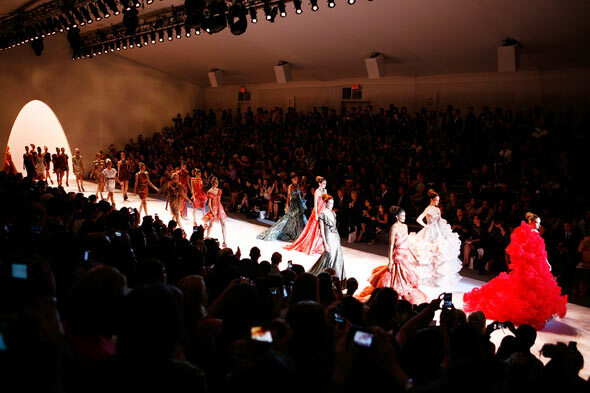 Paris, Milan and New York hold the largest fashion weeks twice a year. Other big cities that have a fashion week are Toronto, Tokyo, Shanghai, Berlin Los Angeles and dozen others. To participate well established labels don’t have to pay entry fee, nor they need to pay for the venue since tickets are sold to attend that cover these costs. They however have to pay for decoration and operations of the show they are putting. A fashion show revealing the new collection can easily cost hundreds of thousands of dollars according to Forbes. Cost is broken down between setting up the venue decor, furniture, building the runway and backstage room, hosting a reception, hiring models, stylists and make-up artists and so forth. According to Forbes interview with a famous fashion show producer Thomas Onorato, certain costs may appear surprising. Large labels can shell $20,000-50,000 just to hire a celebrity stylist or makeup artist, which in turn will pay off in increased sales if presentation goes well. Some models request a special suite, that of course, has to be built at participating label’s cost, this on the top of paying the model. A famous phrase by Linda Evangelista “We don’t wake up for less than $10,000” which was said back in 90’s gives us a rough idea how much just a few minute appearance can cost designers. A newly emerging label has to pay differently. While it is up to them how much operating expenses they want to spend, they have to pay for venue rental on top of that. As venues compete for business, some offer value-add participation by providing services such as lighting and stage organization such as MAC and Milk in New York. But even to those, to get in, a designer has to be invited. So, you can’t be just completely new label. As shows get larger, with close to 300 labels showcasing collections a few minutes apart during the week, scheduling of events is becoming more challenging. Paris fashion week has a reputation of a very good organization with not more than one large label showing the collection per hour. This gives media time to switch between the viewings. New York fashion week in contrary, has a bad reputation of scheduling that affects labels in the long term. If media and photographers didn’t get a chance to make good pictures there will be no publicizing later. Perhaps this is the reason why so many grand labels, such as Versace or Dior for example did not participate in the New York fashion week this year. In a slow economy labels have a choice where to put their money. H&M lovers have been waiting for this moment way too long. And here it comes: H&M announced today a collaboration with the house of Versace. H&M is a trendy Swedish company that caters to young people. Label made a name retailing low priced, high quality and trendy fashion. Currently 2200 stores worldwide offer a huge selection of clothing, shoes, lingerie and accessories. H&M earned reputation for showing off the low price, $19.99 for a pair of jeans or $49.99 for a trendy coat at their super model ads. While company has been growing organically since its foundation in 1947, collaborations with premium brand designers have brought the H&M label to a completely new level. First collaboration was in 2004 with Karl Lagerfeld. While it was a huge success with lineups stretching around the block and the collection selling within days, Karl criticized the organizers for underestimating the demand. His idea of the collaboration was that people would get a bit of Chanel experience when they can come to stores at the relaxed pace and try the clothing with no restrictions. He feared that H&M collection will cheapenize his lables’ luxurious image. Since then H&M released close to 10 guest designer collections, most notable being Roberto Cavalli, Stella McCartney, Viktor & Rolf and most recent Lanvin. All designers have expressed appreciation to participate and were happy with PR outcomes. Many low priced retail companies followed the idea and launched their own partner collections. For example Target had collections done by Alexandr McQueen, Jean Paul Gaultier and Milla Jovovich. Issac Mizrahi made collections for Target in 2002 and Fairweather. Versace collaboration news have already exploded the press. Bloggers and fashion journalists are very excited about an upcoming H&M – Versace release that is scheduled for late November, 2011. Donatella shared her vision for the collection: “The collection for H&M will be “quintessentially Versace,” inspired by the archives, and including clothing, shoes, accessories, and jewelry for men and for women.” Apart from clothing pieces collection will also include home pieces such as Versace for H&M pillows and a bedspread.